It was a beautiful day today that felt more like mid-spring than the tail-end of winter. 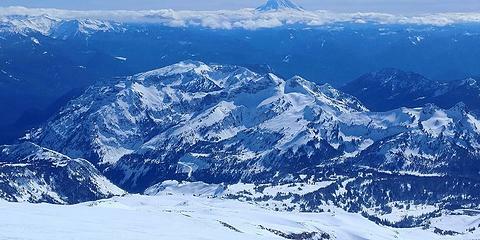 Mostly calm but with the occasional light breeze up on the snowfield. 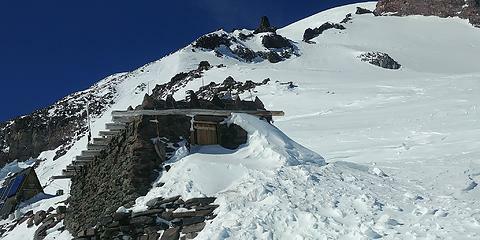 I skinned most of the way to Camp Muir in a t-shirt, although around 9,500 ft. I did need to layer up. The snow below 7K was great for skiing in the morning but turned to mush in the afternoon. 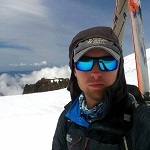 The snow above 7K was firm and a little wind-affected but still pretty decent for skiing. Little or no ice anywhere. For non-skiers, snowshoes were definitely a good idea today, but tomorrow I expect they won't be needed. There was quite a conga line heading up the mountain, so I would expect a decent bootpack to be in place tomorrow. Also, surprisingly, they managed to open the gate on time today. 10 minutes early, in fact. I counted 90 cars that went by before 9am. I bet Paradise was packed. Total circus. Tourists everywhere. One big Mounties/Mazama/whatever group camped right near the sledding area. Then there was a Boyscouts group or something camped a little higher up. On my way up to Pan Point I passed a huge group carrying stupidly large packs while all roped together on their way down from Camp Muir. Their members were falling down and generally looking ridiculous. I've never seen anyone roped together just outside Paradise. I asked one of them if they summited and they said no. 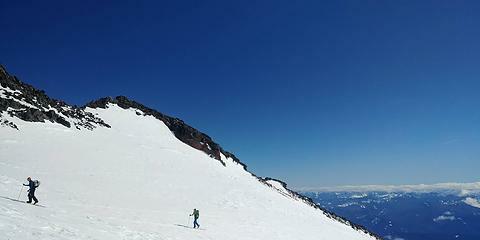 while all roped together[/u] on their way down from Camp Muir. Odd indeed. 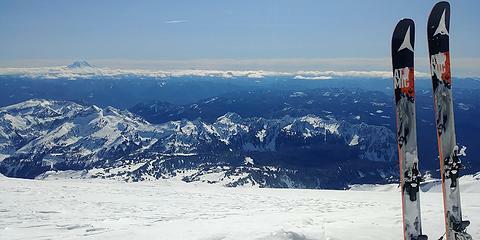 Reminds me of the time I saw three novices who became frightened on the Fisher Chimneys route on Shuksan. We summited and on our return a few hours later we witnessed the same trio, still apparently frightened, still wearing crampons on the trail down by Swift Creek as they slowly made their way back up to the trailhead at Austin Pass. The trail was bone dry, completely devoid of snow! 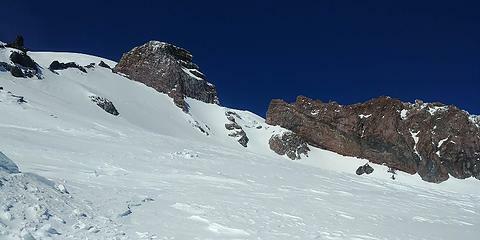 ...while all roped together on their way down from Camp Muir. Reminds me of something I saw on Mount Daniel a few years ago. A party of four was roped up while crossing a short section of semi-steep dirt (with a bootpath), far away from any snow. The leader was trying (and failing) to sling a rock that looked like it weighed no more than 50 pounds and could let go at any moment. Never thought I'd see anyone attempt a running belay on class 2 dirt...it was weird. Years ago I was out practicing various roped travel techniques on what was basically a forest service road. It was part of a climbing course. Another party saw us and actually mentioned us in a trip report they posted here. They were quite confused and amused. A few weeks later we climbed the Ice Cliff Glacier on Stuart using those techniques we practiced. You gotta start somewhere. You won't know their motives unless you ask!